Egg farmers are vigilant in setting and maintaining advanced biosecurity protocols, and biosecurity programs have improved significantly over the past three years. UEP and egg farmers collaborate with the U.S. Department of Agriculture, state agencies, veterinarians and public health officials to responsibly evaluate biosecurity and address the needs of the hens, farms, employees and local communities. UEP established a Biosecurity Taskforce of egg producers to provide resources and develop guidance for programs like the National Poultry Improvement Plan. While no two are exactly alike, here are examples of biosecurity practices that are employed at egg farms. Viruses that are harmful to birds can be carried and spread unknowingly on clothes and footwear, vehicles and equipment. To limit the chance for disease to be brought onto the farm, only employees and approved service providers are allowed onto egg and poultry farms. Egg farms may disinfect all vehicles, footwear and equipment upon entry on the farm or into a barn. Egg farmers also limit the movement of personnel, vehicles or equipment between different farms when possible. Some egg farms feature a guard at the entry point and require all drivers to complete paperwork before gaining entry to the farm. Farms have installed footbaths that disinfect the footwear of anyone entering the barn. When used, the footbath is changed daily, or even more often if it collects dirt, egg contents or manure. Hand-washing, or hand-sanitizing stations are being used at the entrances of many egg farms. Many egg farms now use a Danish entry system, which provides more separation between the outside environment and the hens’ living area. Personnel are required to change footwear when they enter the hen house. Some egg farms have added designated changing areas, where personnel “shower in” and change into designated coveralls and protective gear that stay at the farm. When their day’s work is done, they “shower out,” change back into their original clothes, and leave the designated clothing at the farm. This shower in/shower out system further limits the chance that a disease could come onto the egg farm through clothes or footwear. Procedures are in place to prevent the accidental entrance of wildlife and water fowl and to remove them from poultry houses and other areas should they gain entrance. Feed bins and mills are secured to prevent contamination by wild birds or rodents, and spilled feed is cleaned up promptly, so it does not attract wild birds and rodents. Many egg farms house their hens indoors to prevent exposure to wild birds, waterfowl, pests and rodents that may spread disease. Another way some farms reduce water fowl is by stringing fishing lines over ponds to prevent wild birds from landing and potentially spreading disease. While the biosecurity process is complex, Egg farmers continue to focus on continuous improvement in biosecurity to protect U.S. flocks. 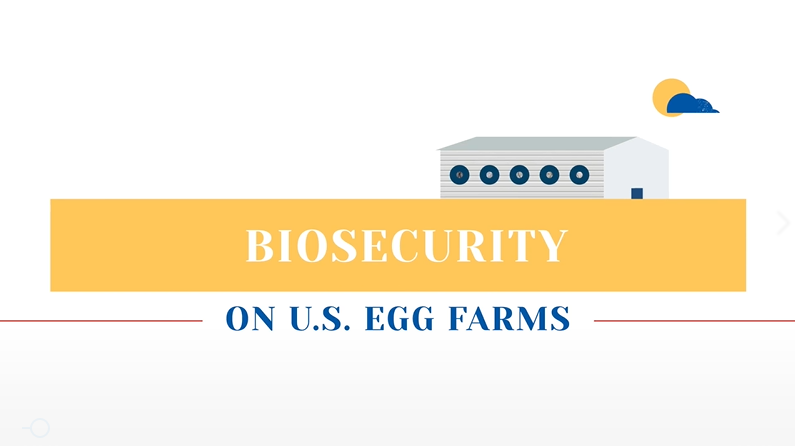 Watch this video to learn more about biosecurity on egg farms.